Sometimes out-of-the-box SugarCRM modules don’t fully satisfy your needs, and you have to create custom modules instead. 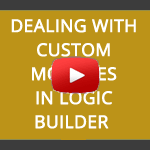 In this short video we demonstrate how to deal with custom modules in Logic Builder. As a matter of fact, there is no big difference if you work with a custom module or a standard one. However, this illustrative example explains the principle of working with custom modules in more detail.